I recently wrote a blogpost for Tweak Your Biz discussing my answer to ‘What do you think of my business idea?’ To summarise, I always respond that it is your customers (and the market) that are the final arbitrator of whether you have a business. This blogpost is a follow up which asks, how do you build a business when what you are selling is your skills, domain knowledge and expertise. This is an important question for Ireland Inc. which is increasingly reliant on the Services sector as evidenced by a 2010 CSO report which found (page 22) that new service enterprises accounted for 56.9% of the 10,500 new jobs created in Ireland by new enterprises in that year. It is also an important question within the context of a growing proportion of people in their 50’s and 60’s who instead of retiring or looking for a new job are looking for customers. I recently read an eBook called The Boomerpreneur Revolution: How Baby Boomers Are Turning Their Knowledge into Profits by Richard Grehalva. 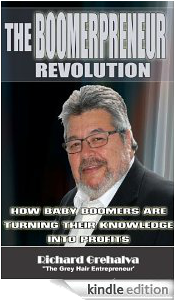 While I am a generation after the Baby Boomers as per the title of Richard’s book (more likely one of the Pope’s children as per David McWilliams book of the same name), I can really relate to the Boomerpreneur Revolution. The author confidently declares that if you can talk about whatever it is you are passionate about and teach it, then you can develop and sell information products. When I am talking to someone who is embarking on a startup journey, I ask them to clarify how their skills, domain knowledge and life/business experience fits the story that they are going to tell the world. I will now be adding that they should read ‘The Boomerpreneur Revolution’ as it supplies a framework to think about how to establish a business that sells expertise based information products. Mr Grehalva, who I have emailed several times over the last few years, has published a superb video explaining why you should buy his book. Here is a quick summary of The 5 Knowledge Business Activators – as taken from page 18 of the book. Your success begins and ends with you. You will discover your specific motivation triggers to accelerate your performance on a daily basis. We establish your positioning strategy in your market niche. Your product blueprint is created by applying the formula Problem plus Result equals A Solution. Developing your business model with what you will offer that is unique and valuable, instead of being not unique and not valuable. Creating your Magnetic Marking Movement Strategy. We will position you as an expert with your online visibility strategy including videos, eBooks, webinars and more. You will become the trusted source in your market niche. Richard identifies that what baby boomers have that is valuable is knowledge. He has put into 5 steps: what works, and what you need to know to build your information products, that will take what you know, monetize it, and successfully launch your business. I also think that the book is a valuable read for anyone in business as it is a very practical read! * Interested in becoming volunteer mentors. The Event Programme includes a strong line-up of speakers and engaging workshops. Unfortunately, I cannot attend as I had a long standing diary commitment. I believe that one is never too old to start a business if they approach it with the right mindset. The questions posed in Richard’s book are a great starting point. As I have posted previously, I am a local judge on the Student Enterprise Competition. I am always amazed at the drive, commitment, smart ideas and the overall enthusiasm displayed by the students. My career also includes managing a startup incubator in a 3rd level institution to include introduction of a practical entrepreneurship programme called MarketLink. – being open to leverage the knowledge of mentors and other advisors, to embrace the knowledge gained by business people over many years. We need the elderly to become Elders and share their stories and for young people to seek them out. As always, I hope you find this blogpost of interest. I welcome all readers to leave comments to stimulate some discussion.